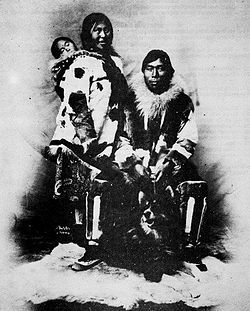 The Chukchi or Chukchee, Russian: чукчи (plural), чукча (singular), are an indigenous people inhabiting the Chukchi Peninsula and the shores of the Chukchi Sea and the Bering Sea region of the Arctic Ocean within the Russian Federation. They speak the Chukchi language. 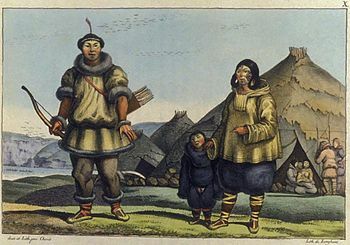 The Chukchi originated from the people living around the Okhotsk Sea. The majority of Chukchi reside within Chukotka Autonomous Okrug, but some also reside in the neighboring Sakha Republic to the west, Magadan Oblast to the southwest, and Koryak Autonomous Okrug to the south. Some Chukchi also reside in other parts of Russia, as well as in Europe and North America. The total number of Chukchi in the world slightly exceeds 16,000. In Chukchi religion, every object, whether animate or inanimate, is assigned a spirit. This spirit can be either harmful or beneficial. Some of Chukchi myths reveal a dualistic cosmology. In the 1920s, the Soviet Union prohibited Chukchi religious practices and tried to suppress their religion..
After the collapse of the Soviet Union, the state-run farms were reorganized and nominally privatized. This process was ultimately destructive to the village-based economy in Chukotka. The region has still not fully recovered. Many rural Chukchi, as well as Russians in Chukotka's villages, have survived in recent years only with the help of direct humanitarian aid. Some Chukchi have attained university degrees, becoming poets, writers, politicians, teachers, and doctors. In 1762, Saint Petersburg adopted a different policy. Maintaining the fort at Anadyrsk had cost some 1,380,000 rubles, but the area had returned only 29,150 rubles in taxes. The government abandoned Anadyrsk in 1764. The Chukchi, no longer provoked, began to trade peacefully with the Russians. From 1788, they participated in an annual trade fair on the lower Kolyma. Another was established in 1775 on the Angarka, a tributary of the Bolshoy Anyuy River. This trade declined in the late 19th century when American whalers and others began landing goods on the coast. The first Orthodox missionaries entered Chukchi territory some time after 1815. ^ Chisholm, Hugh, ed. (1911). 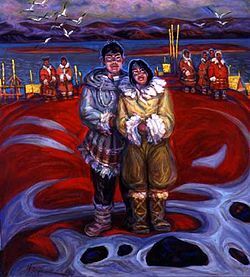 "Chukchi". Encyclopædia Britannica. 6 (11th ed.). Cambridge University Press. p. 323. ^ a b Shentalinskaia, Tatiana (Spring 2002). "Major Pavlutskii: From History to Folklore" (PDF). Slavic and East European Folklore Association Journal. 7 (1): 3–21. Retrieved 2009-07-18. This page was last edited on 8 July 2017, at 01:46.